You've been out all day; your face is tanned, dark and tired. Your eyes are puffy and tired after hours at work. With a glam party to attend in a couple of hours, what do you do when aren't exactly looking like lady-killer material or a handsome guy? 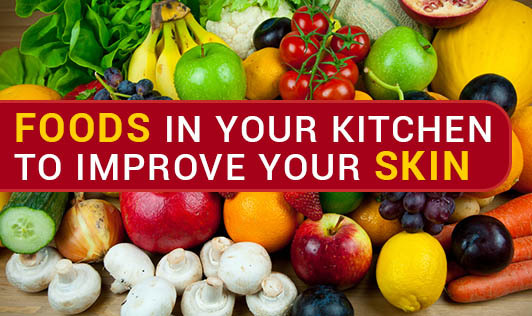 By using these readily available kitchen products, you can spruce up your appearance within minutes. Curd/Yogurt: Removing tan and soothing sunburn: Apply a little homemade curd on the affected areas of the skin. It will not only help in soothing the sun burn but will also clear away the tan. Do not use curd if you have oily or sensitive skin. Lemon juice & glycerin: Removing tan and to improve fairness: While curd works well to remove tan, it's not a good option for facial skin that's sensitive, oily or susceptible to acne. It is a better option for acne ridden skin is to apply lemon juice mixed with glycerin. The mixture should be strictly on a 50-50 basis. Add equal amounts of lemon juice and glycerin, apply it on the face and keep it for 15 -20 minutes, and then wash it off with cold water. Cucumber: tired eyes and dark circles: Tired and puffy eyes make you look overworked and fatigued. So while a good long nap would be a great idea, one of the best possible quick fix solutions would be to place a slice of cucumber on each eye and relax for a 20 -25 minutes. Tea bags: puffy eyes: Another very effective way of making tired, sore eyes sparkle with energy is to soak a tea bag in lukewarm water for a few minutes and then place one on each eye. Leave them there for about 20 minutes. Coriander Leaves: lips: Massaging your lips with the juice of Coriander leaves (dhania) will makes your lips rosy and soft. Honey and olive oil: hair conditioner: Make a smooth paste by mixing two spoonfuls of fresh honey with a single spoon of olive oil. Massage into your hair, starting with the roots and ending with the tips of your hair. Then, keep your hair covered with a shower cap and let the mixture seep in deep into your scalp. After 20 minutes, use a gentle herbal shampoo to rinse off the mixture. Look ravishing with simple kitchen products! And its price is free!